Image from the Morgan Library. And the next day I had to confess I’d made it all up, and not even deliberately. Nets, not clubs: nets are the thing if you want to hunt a badger. And then last night: I realized we’d slogged through nearly an entire semester of The Canterbury Tales without once mentioning the risings of 1381. The Nun’s Priest’s Tale (“Certes, he Jakke Straw and his meinee” &c, VII.3394 ff.) gave me my entrance, and the animal theme led me to my grand finale: the story of the St Alban’s rebels, who, to show their contempt for the poaching laws, crucified a rabbit. My friend, in this case, is Thomas Walsingham. And forgive my Latin, because neglect. Feel encouraged to correct me. They seized a certain living hare, taken by force by them in the open field by a great crowd of people, and had it carried among them on a spear and fastened it upon a “collistrigium” (a pillory) as a sign of the liberty and warren thus obtained. Something quite other than a crucifix. 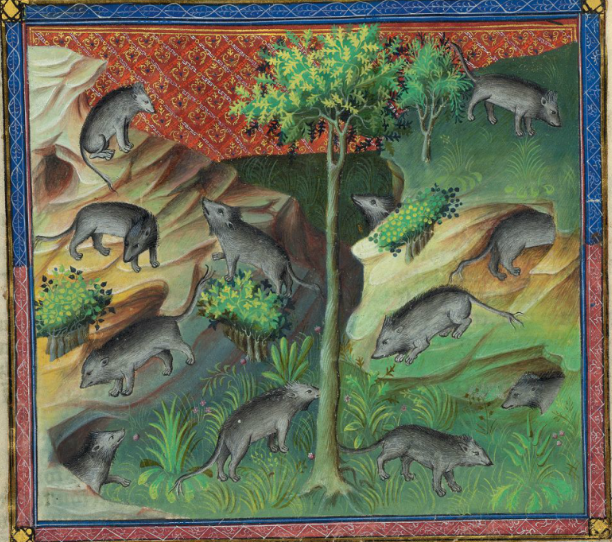 This entry was posted in MedievalBlog and tagged animals, chaucer, fumblr, pedagogy, rabbit by medievalkarl. Bookmark the permalink.